Copper-coated horseshoe nails took the farrier profession by storm in 2015 when “Liberty Cu” nails were introduced by Royal Kerckhaert in Europe. A novelty at first, the new nails gained favor with many farriers who claimed they observed an improvement in the quality of the nail hole or the hoof wall itself. The nails spread to farriers in many parts of the world. Several farriers designed informal field tests, such as shoeing the same foot with plain steel nails on one branch and copper-coated nails on the other, or shoeing a left front with copper and a right front with steel and comparing the results. Sales must have been significant, as other nail manufacturers followed Kerckhaert’s lead and began offering a range of copper-coated nails. The marketing was based on anecdotal evidence. In 2017, Kerckhaert added a copper-coated raceplate to its offerings; it was worn in a Group One race victory in France, and on a well-regarded British turf runner in the 2017 Breeders Cup Turf in California, among others. Fast forward to June 2018: An article evaluating the effects of copper-coated horse nails will be published later this year in the peer-reviewed Journal of Equine Veterinary Science; it details an Australian study of horseshoe nail holes in hooves by Brian Hampson, PhD, and farrier John Wilson. A top British three-day event horse, ridden by Flora Harris, was one of several shod with copper-coated nails for a four-star event in 2017. Photo courtesy of Charlotte Aitken. The study is a straightforward comparison of left and right feet shod over two six-week shoeing cycles with either steel or copper-coated nails. Six horses then went through a washout period, and concluding with a crossover, so that those horses' hooves had been documented with both steel and copper-coated nails. The study's methods, including shoe type and horse selection criteria, are described in detail in the paper. 3) a 10-point scoring system devised by the authors evaluates relative pathology in nail holes at the time of shoe removal. In addition to documenting the crossover shoeing study, the manuscript is illustrated by high resolution "macro" photos of nail holes, taken when shoes were removed. 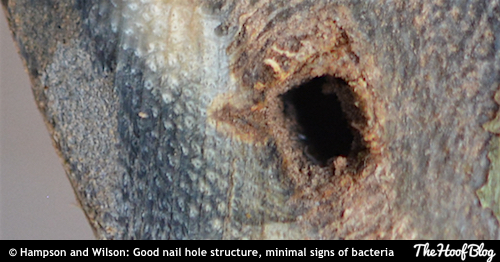 Hampson and Wilson devised a scoring system to evaluate nail hole morphology and pathology. Feet and nail holes were subject to“blind” assessment of the holes by a scorer who had no knowledge of the hooves or the nails used. 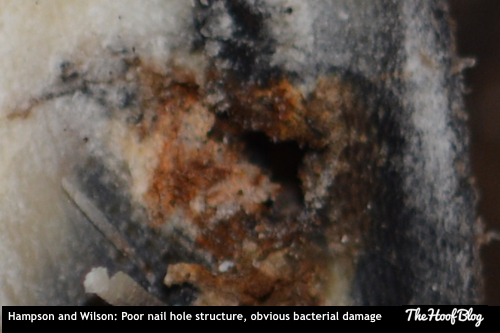 “In this study the use of copper-coated nails was associated with significantly less nail hole pathology than was seen with the use of traditional steel nails,” the authors wrote. 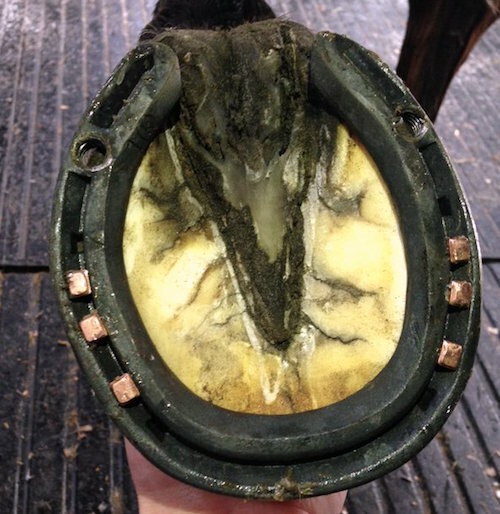 "The soundness of the hoof wall ultimately depends on many factors such as correct trimming, correct shaping and fitting of horseshoes, and overall horse health," they concluded, noting that the inclusion of copper preparations to horseshoes may also provide further benefit by leaching copper ions to the total ground bearing border of the hoof wall." The authors suggested that a limitation of using copper nails is that they only appear to have an effect on the actual nail hole. Direct contact between bacteria and the copper substrate is required for an anti-bacterial effect. The authors suggest that if the nail coating had a leaching effect, a better score might result. One of the hallmarks of a study is that its results would be reproducible by others; hopefully others will be able to conduct similar tests in other climates, or on horses subject to known pathogens. 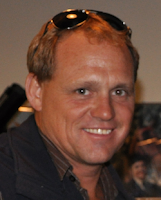 Brian Hampson is known for his oft-cited 2011 PhD thesis, “The effects of environment on the feral horse foot”, detailing the morphology of feral horse hooves in Australia and other places in the world, with special attention to the effects of environmental extremes on the horses' feet. He earned his PhD with Professor Chris Pollitt at the University of Queensland, who is thanked in the article for his contributions to the study concept and discussion of results. Hampson and Wilson’s study will be published in a future edition of Journal of Equine Veterinary Science. In the meantime, it is undergoing final edits and is available to be viewed online in either HTML format or as a manuscript-format PDF. A page-format edition will be posted on the JEVS website when it is available. Access to the full article is limited to subscription or library access holders. If you want to read the paper but do not have access, check with your school or community reference librarian to find out if a download can be arranged through your library. Alternately, a download can be purchased from the publisher, although it is early days, and the article is not yet in page format. The abstract (summary) is available for all to read, at no charge. 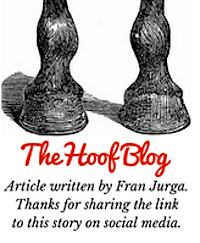 Click this link to subscribe to HoofSearch online. This article and dozens more like it will be indexed and linked in the monthly HoofSearch report for June. 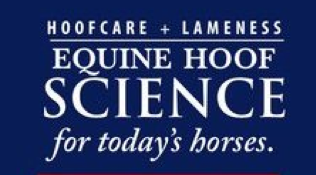 HoofSearch provides a monthly update of all new peer-reviewed articles in the areas of equine anatomy, biomechanics, growth, imaging, and therapeutics, as well as specific topics such as hoof science, hoof problems, laminitis, navicular disease, racing injuries and breed/sport lameness. HoofSearch also tracks new patents of hoof-related products.